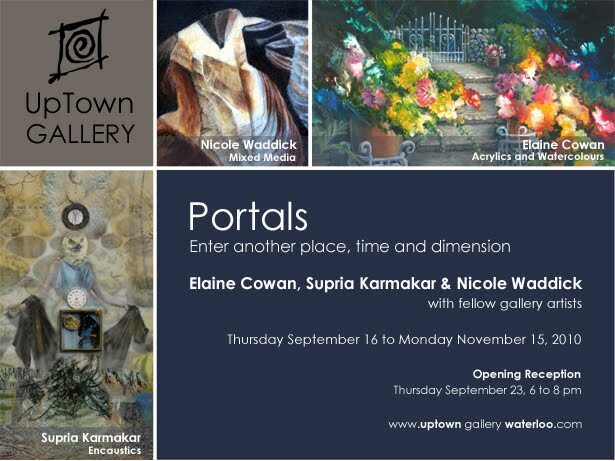 http://supriasdesigns-encausticmusings.blogspot.com: Elora -Fergus Studio Tour opens next weekend and UpTown Gallery opens new Portal Show, Waterloo, ON. 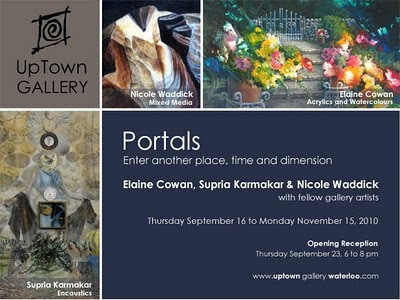 Elora -Fergus Studio Tour opens next weekend and UpTown Gallery opens new Portal Show, Waterloo, ON. Group Show for the Elora - Fergus Studio Tour opens tomorrow, Thursday September 16th 7 p.m. at the Elora Centre for the Arts. This year, the studio tour includes 33 local artists, all opening their studio spaces to the public. This is a free event and starts the weekend of September 25th and 26th and ends the second weekend Oct. 2nd and 3rd, 10- 5 each day, Saturday and Sunday. Starting at the Elora Centre for the Arts gives you a full sampling of the local talent in the area. congratulations Supria! i know you will do well! !